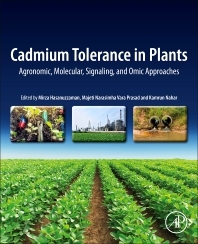 Cadmium Toxicity and Tolerance in Plants: Agronomic, Genetic, Molecular and Omic Approaches presents research and latest developments on mechanisms of cadmium tolerance covering both lab and field conditions. This book contains important insights and options for minimizing Cd accumulation in plants and mitigating Cd toxicity. Topics covered include using various omics approaches to understanding plant responses to Cd, novel technologies for developing Cd tolerance and integrated breeding approaches to mitigate Cd stress in crops. Cadmium Toxicity and Tolerance in Plants: Agronomic, Genetic, Molecular and Omic Approaches is a valuable resource for both researchers and students working on cadmium pollution and plant responses as well as related fields of environmental contamination and toxicology. Dr. Mirza Hasanuzzaman is Professor of Agronomy at Sher-e-Bangla Agricultural University in Dhaka. He is a specialist in agronomy, plant stress responses, and crop physiology. His current work is focused on the physiological and molecular mechanisms of environmental stress tolerance (salinity, drought, flood, and heavy metals/metalloids). Dr. Hasanuzzaman has published over 60 articles in peer-reviewed journals. He has edited six books and written 30 book chapters on important aspects of plant physiology, plant stress tolerance, and crop production. Dr. Prasad has served the Ministry of Environment, Forests and Climate Change, Government of India in various advisory committees on biodiversity conservation, ecosystem services, pollution control and abatement, environmental information systems and bioremediation of contaminated sites. He is an active visiting scientist in several international universities. He is the editor, co-editor, or author of 17 books published by leading international publishers and 190 journal articles and 118 book chapters/conference proceedings. He has made outstanding contributions to the fields of bioremediation, bioresources, biomass energy sources, bioeconomy and to the broad field of environmental biotechnology, all of which are his main areas of expertise. Dr. Kamrun Nahar, Department of Agricultural Botany, Faculty of Agriculture, Sher-e-Bangla Agricultural University, Dhaka, Bangladesh – She is well expert in the field of Plant Physiology, Ecology, Molecular Biology and Abiotic Stress Tolerance. Published 1o book chapters and more than 30 research articles.